Goibib Mountain Lodge is the perfect Namibia holiday destination with excellent accommodation between Grunau and Keetmanshoop in southern Namibia. We are situated on the B1 route 112 km south of Keetmanshoop and 48 km North of Grunau. Southern Namibia is well known for its Namibia holiday destination that has geological attractions such as the Fish River Canyon and Quiver Tree Forest. We offer you the perfect Namibia holiday destination in Southern Namibia where one can explore the scenery whilst making use of our services and activities. Browse around our website to get the ‘at home feeling’ as described by our guests. DSTV available in the central TV lounge and various rooms. Our Namibia holiday rooms comprises eight spacious en-suite rooms, each a haven, allowing guests to enjoy ultimate rest and relaxation. All rooms are designed to include the comforts of home even though its a Namibia Holiday so they are equipped with air-conditioning, minibar, built-in safe, complimentary coffee and tea and free WiFi is available on site. Why the best Namibia Holiday Destination? Local and International satellite television is available throughout the lodge. Babysitting is available on request. We invite guests to enjoy refreshments at the poolside lapa and cool down by taking a dip in our swimming pool. En-suite rooms at the lodge are individually decorated with comfortable surroundings ensuring all guests feel at home. En-suite rooms at the lodge are individually decorated with comfortable surroundings ensuring all guests feel at home. Wheelchair option available on request. plus N$ 200.00 per extra person over 12 years. 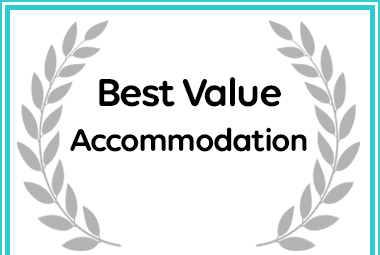 Afristay has named Goibib Mountain Lodge a Best Value Establishment. 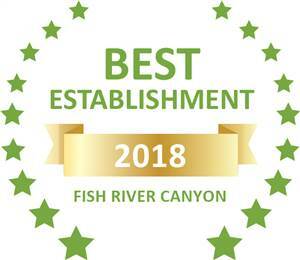 Based on reviews of establishments, Goibib Mountain Lodge has been voted Best Establishment in Fish River Canyon for 2018.